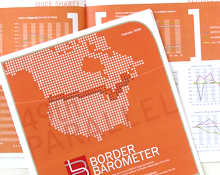 The Border Barometer, a joint program of the UB Regional Institute and the Border Policy Research Institute of Western Washington University, presents data and analysis to inform cross-border issues. Focusing on economic flows across the border, the effort has developed a series of indicators of border performance, including measures of porosity, or the flow of goods across the border, and border infrastructure, the physical and organizational capacity to support such flows. The pilot research brief was released in February 2009, with a second edition completed in February 2010. The tool is widely distributed to key policy makers and stakeholders in both nations, including through conferences and events.